Speaking about addiction, and moreover about the gambling one, there always will be many incomprehensive facts, that an ordinary person won't be able to understand alone. And if it happens, that you have called your partner or somebody else addicted, be attentive, because you really may be wrong, if you are not aware of all the peculiarities of the gambling addiction. Read the following information and try to sort out the myths and facts about problem gambling as well as the most frequently asked questions. It is told: To become a problem gambler, you have to play every day. It is right: If a gambler is really problematic, it doesn't matter how frequently he\she plays. If gambling causes problems, thus it'll be the problem one. It is told: If the gambler affords the problem gambling, thus there is no problem. It is right: The financial problem of gambling is not the main thing to worry about. Excessive gambling leads to the breakdown of other valuable things as relationship and friendship. It is told: Partners of gamblers that play too much provoke them to do the same. It is right: To blame others in the gambler's own problems is really usual for addicted people. In such a way, they don't want to take responsibility for their actions. It is said: If problem gamblers have many debts, you have to help them in this. It is right: It can even deteriorate the situation, don't do this. Bailing the gamblers out of their debts will make the problem more serious. How to limit gambling? The only way to do it is to try to handle it yourself. Before gambling, just try to establish the betting limit, thus you'll follow it. What kind of people tend to be problem gamblers? Everyone can develop this destructive habit and even become one of the addicted gamblers. People have to be aware of the risk, if they start playing. I seldom go on a gambling spree. Am I a problem gambler? Even if a gambler has these periods when he's not at the casino, he's still thinking to gain more. Pass the addiction test to find out your condition. What are the main characteristic signs of the compulsive gambler? Unwillingness for the reality acceptation; insecurity of emotions; immaturity. What gambling types can provoke gambling addiction? Just any type of gambling games can be the cause of problem and compulsive gambling. But the fast- speed games may provoke a desire to return to playing more quickly. What responsibilities does the industry of gambling take? All the casinos and any other gambling establishments must develop different programs and anti-addiction policies to forewarn people of problem gambling. Are problem gamblers addicted to other things in the same way? 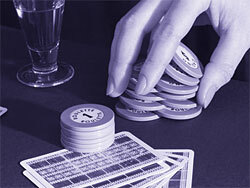 Players, who have gambling addiction, can be easily manipulated by others. Alcohol and drugs are the most frequent friends of problem gambling.